Land Acquisition—Notification—Civil Court has no jurisdiction to decide the validity of the acquisition notification & proceedings arising there from. Comments Off on Land Acquisition—Notification—Civil Court has no jurisdiction to decide the validity of the acquisition notification & proceedings arising there from. Land Acquisition—Post notification sale instances—They cannot be taken into consideration even if they are few days later from date of notification. Comments Off on Land Acquisition—Post notification sale instances—They cannot be taken into consideration even if they are few days later from date of notification. Section 11, Section 25, Section 4, Section 9 Motor Vehicles Act, 1988 – Section 166 Land Acquisition—Compensation—More than claimed can be awarded by court to award just and fair compensation. Comments Off on Section 11, Section 25, Section 4, Section 9 Motor Vehicles Act, 1988 – Section 166 Land Acquisition—Compensation—More than claimed can be awarded by court to award just and fair compensation. Land Acquisition—Even if the objections of the appellant under S.18 were not considered that would not be a bar to seek re-determination of compensation under S.28-A. Comments Off on Land Acquisition—Even if the objections of the appellant under S.18 were not considered that would not be a bar to seek re-determination of compensation under S.28-A. Land Acquisition Act, 1894, S.4–Quashing of Notification-Notification was published in ‘Dainik Bhaskar’ (Hindi) Chandigarh Edition and not in Faridabad Edition, though the land is located in Faridabad, hence there was violation of provision of Section 4 (1) of the Act. Comments Off on Land Acquisition Act, 1894, S.4–Quashing of Notification-Notification was published in ‘Dainik Bhaskar’ (Hindi) Chandigarh Edition and not in Faridabad Edition, though the land is located in Faridabad, hence there was violation of provision of Section 4 (1) of the Act. Land Acquisition—Notification for multiplication factor not issued under 2013 Act—Mere instructions cannot be considered as compliance to the statutory requirement—Award set aside. Comments Off on Land Acquisition—Notification for multiplication factor not issued under 2013 Act—Mere instructions cannot be considered as compliance to the statutory requirement—Award set aside. Doctrine of Merger–Principles enumerated. Acquisition–Exemption obtained by fraud–Recalling of order by High Court after 13 years; justified. Comments Off on Doctrine of Merger–Principles enumerated. 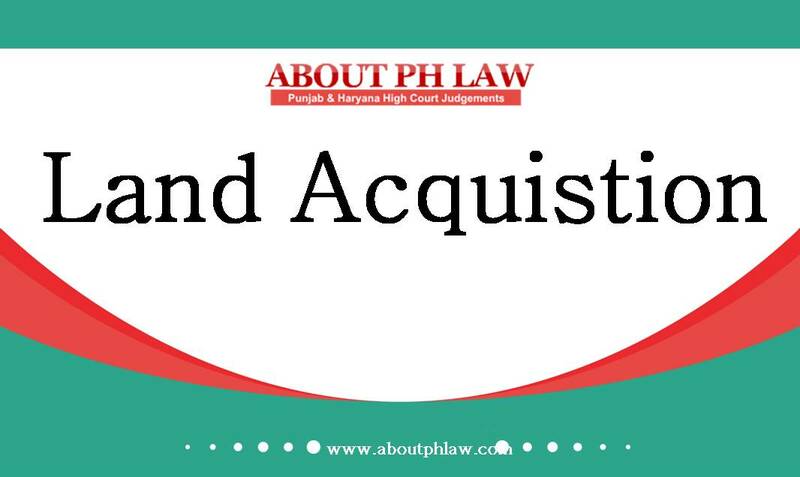 Acquisition–Exemption obtained by fraud–Recalling of order by High Court after 13 years; justified. Land Acquisition—Development Charges—Where no further development of any kind whatsoever is required than no cut is to be imposed towards development charges. Comments Off on Land Acquisition—Development Charges—Where no further development of any kind whatsoever is required than no cut is to be imposed towards development charges. Land Acquisition—Compensation—Post acquisition allottee has no locus to be heard in the matter of determination of compensation. Comments Off on Land Acquisition—Compensation—Post acquisition allottee has no locus to be heard in the matter of determination of compensation.